If you haven't read Part One (Creating Healthy Habits), you can click here to read it. 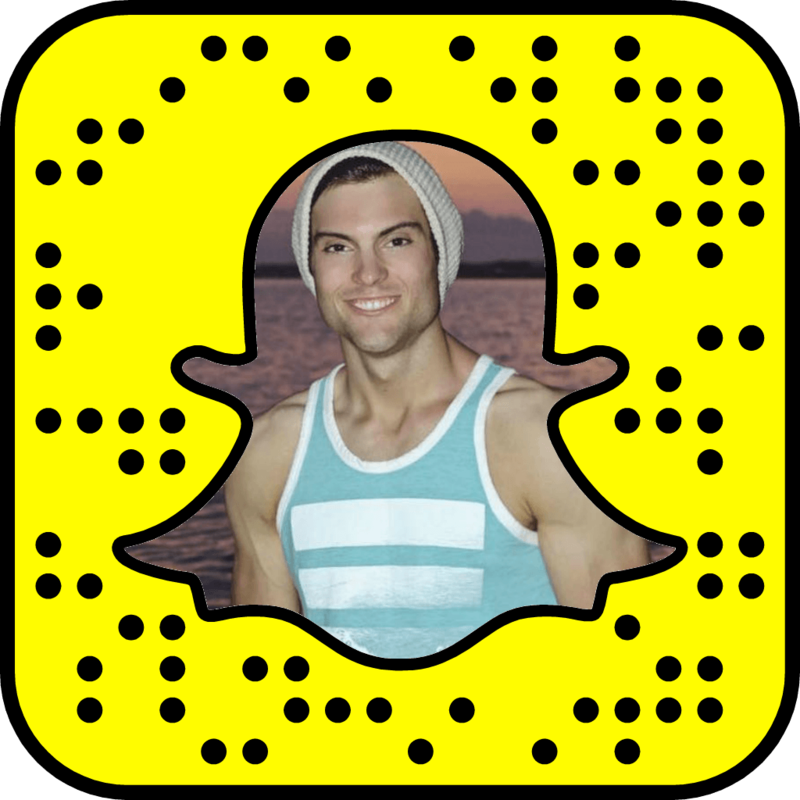 If you'd rather skip it and jump straight into this post, that's cool too :). Anyways, In Part One we talked about the importance of healthy habits and how to create them to improve your weight loss success and quality of life! In my program Envision Yourself Thin, I speak to a few KEY strategies that allow for sustainable weight loss (and effortless weight maintenance once you've achieved your ideal weight and body). Mindful Eating is one of those KEY strategies. In this post, you'll learn what mindful eating is, how it can help you achieve sustainable weight loss success and practical steps towards using it in your life! Sit back and prepare to have your mind blown! Most of us spend our day in constant distraction. Every moment is spent thinking about what we plan to do next. This lack of "presence" is one of the root causes of people's struggle with mindless eating. Think about it, when is the last time you sat down for a meal and really enjoyed it? No television, no screaming kids, no thinking about work? When we eat distracted, we can easily begin to develop harmful eating habits such as overeating, unhealthy eating and eating too quickly. All three of these things can lead to undesirable weight outcomes as well (with weight gain and digestive issues leading the charge). The goal with mindful eating is to eliminate these negative eating patterns so that losing weight and maintaining a healthy body become second nature. It's all about creating a unity between your body and mind. Our bodies have the natural desire to be thin and healthy; we just have to relearn the proper way to eat and appreciate food. Most people have two "gears" when it comes to hunger. They are either starving or stuffed. Combine those two reasons above and you create a fat-forming monster! To fix your intuitive hunger, you'll need to address these two problems. Firstly, you'll need to limit processed food and start eating more whole, nutritious foods. Foods that your body wants are things like fruit, vegetables, nuts, legumes, sprouted grains, and organic/hormone-free meats ( a.k.a. whole foods). Before you get all fussy, I'm not saying to completely eliminate the delicious processed foods we all love eating from your diet. On the contrary, I think that small indulgences from time to time are completely fine (who would want to live in a world without pie?). The problem is that too many of these foods typically results in overeating and false hunger. The goal is to have moderation in your diet. Don't think of eating whole foods as being an unpleasant experience. In fact, the longer and more consistently you eat whole foods, the better they'll start to taste, and you'll likely end up enjoying them! 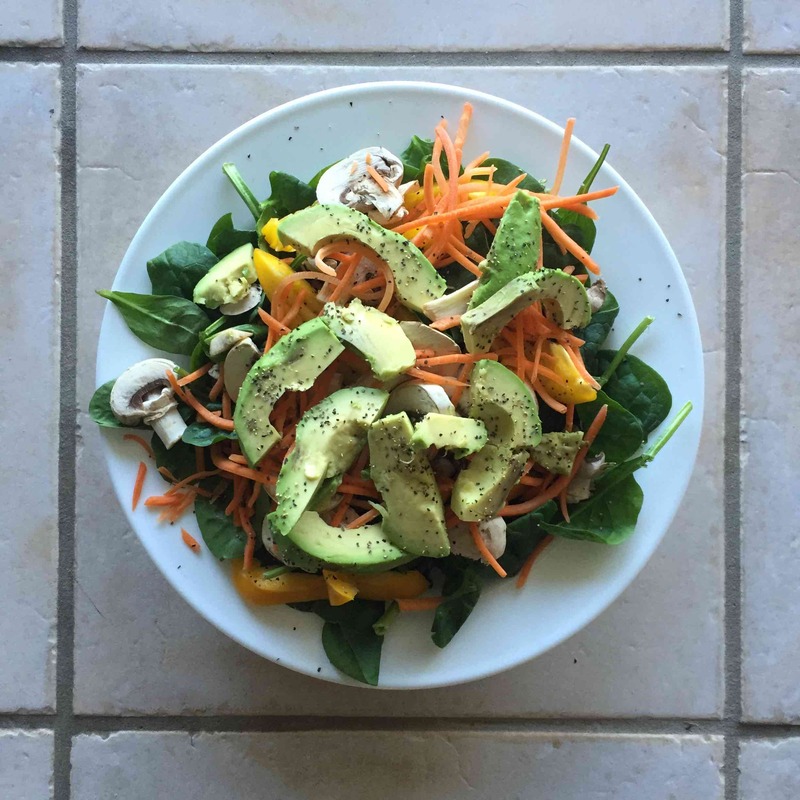 I use to hate salad, but now a delicious, healthy spring mix salad with avocado is one of my favorite dishes to whip up! 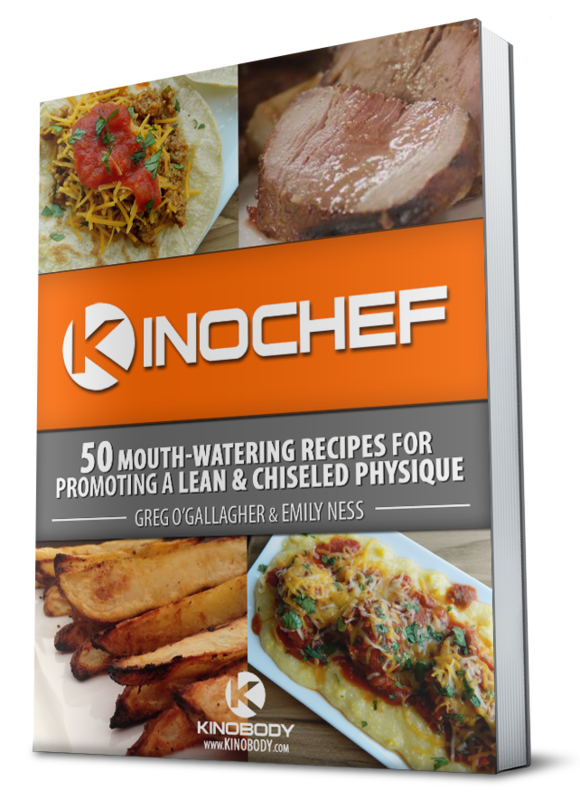 Having problems creating healthy recipes? Luckily, my good friend Emily Ness (blogger over at cookinguphappiness.com) created this epic cookbook for cooking unbelievably tasty meals... the recipes even include calories and macros! Once you've begun eating healthier, you'll need to move onto the next issue people face which is unrealistic perceptions of portion sizes. The media constantly bombards us with images of super-sized meals and extra large triple gulp beverages. This has been one of the main drivers behind the rise in obesity and many health complications we face in America. Not only that, Food Companies are experts at disguising serving sizes on nutrition labels. 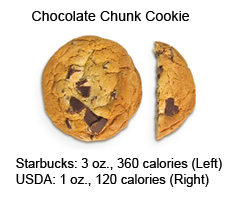 For example, most people would see this cookie from Starbucks and assume the "120 calories" on the label is for the whole thing. More often than not, packaged food like cookies and muffins include 2-3 servings per package. Seriously... if this doesn't make you angry than I don't know what will. How can they get away with considering a portion size a THIRD of a cookie??? Who eats a THIRD of a cookie!?!?! As you can see, eating processed foods and a skewed idea of portion sizes has led many to overeat on calories. What's more is that most people tend to eat to max capacity. The combination of eating high calories foods and desensitized hunger signals is basically an invitation for weight gain. Luckily, there are ways to replace these harmful habits and mindsets with helpful ones. Eating less and becoming more aware of natural hunger signals by using the two suggestions above is one way of doing this!